Monarch Health is a citizen science project to track the prevalence of the protozoan parasite Ophryocystis elektroscirrha (OE) in monarch butterflies. Monarchs infected with OE may be too weak to emerge properly from their chrysalises and can die at this stage. Or, infected monarchs can look completely normal but cannot fly as well or live as long as healthy monarchs. 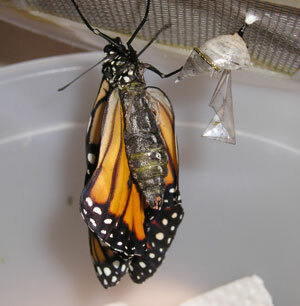 To check for OE in monarchs, citizen scientists first obtain wild adult monarchs by either catching them or rearing caterpillars until they become adults. 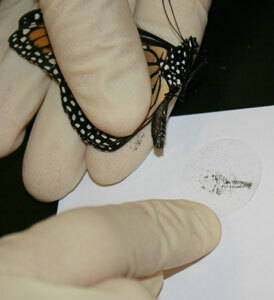 Second, citizen scientists can press a clear sticker against each monarchs' abdomen to collect any parasites. Monarchs are then released, totally unharmed. 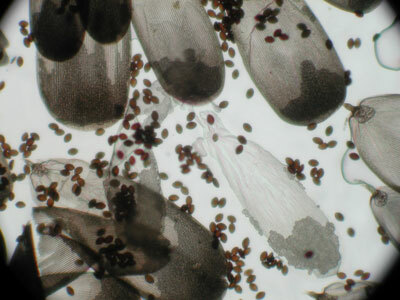 Finally, citizen scientists send samples to the lab at the University of Georgia, where OE parasites are counted under a microscope. Results are shared with volunteers and later the data are reported online or in published scientific articles. Data Availability: Contact program for data availability. Satterfield, D.A., J. C. Maerz and S. Altizer. 2014. Loss of migratory behavior increases infection risk for a butterfly host. Proceedings of the Royal Society B. While most monarchs migrate over 2000 miles to Mexico every year, some monarchs “skip the trip” and stay in coastal areas of the southern U.S. to breed throughout the winter. These monarchs often breed on non-native milkweed, particularly tropical milkweed (Asclepias curassavica), which can grow year-round in warm areas – unlike most native milkweeds which tend to die back in the winter. These researchers worked with over 100 citizen scientists through Monarch Health to test 5,800 monarchs in North America for the protozoan parasite Ophryocystis elektroscirrha (OE). We compared infection levels between migratory monarchs before migration (summer-breeding) and after migration (in Mexico) and non-migratory monarchs in the south (winter-breeding). This research indicated that non-migratory monarchs were up to 5 times more likely to be infected with OE compared to migratory monarchs. In some areas with year-round exotic milkweed, 100% of monarchs were infected! This high disease risk likely occurs because winter-breeding monarchs do not have the benefits of migration, which previous research has shown can weed out sick butterflies and provide an escape from parasites. This study highlights the need for seasonal (rather than year-round) milkweeds to keep monarchs healthy. We recommend that gardeners plant native milkweeds whenever possible and cut back exotic milkweeds to 6” each month during November-February. To learn more about native milkweeds in your area, visit this website for Texas milkweeds and this website for milkweeds in other areas.